During these cold winter months, I always find myself craving a light, crisp, fresh salad to balance out heavier meals. I know that it is not practical to eat salad in the winter, but sometimes I can’t get the idea out of my head. Enter pea shoots! Holy moly, pea shoots solved my winter salad blues. Pea shoots are easy to grow indoors in the winter and taste delicious in a salad. This salad can be made entirely with pea shoots, or mixed with other greens if you have them. I mixed some chopped spinach into this salad when I made it. 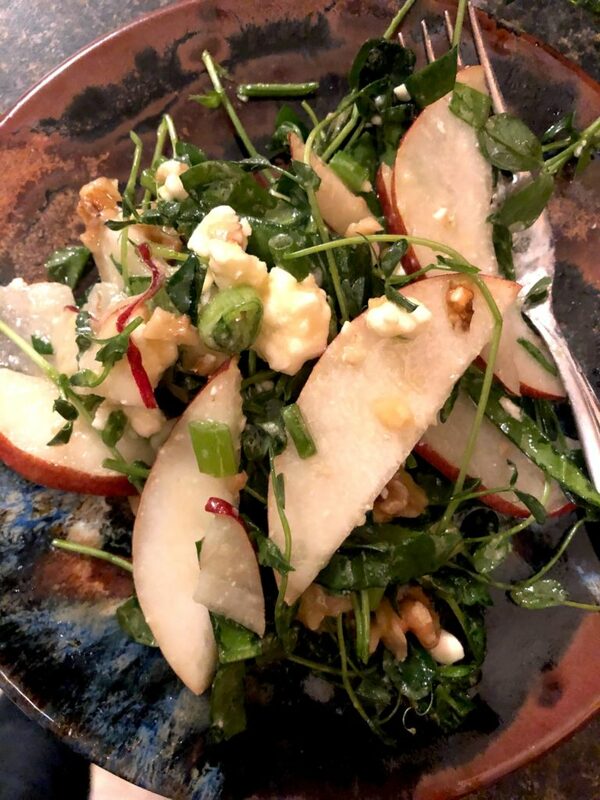 Place pea shoots, walnuts, feta, and pear wedges into a large bowl. Mix olive oil, lime juice, dijon mustard, and honey together and lightly season with salt and pepper. Pour dressing over pea shoots and toss to combine.